Roasting pans and baking dishes are two closely related types of kitchenware. Often, they can be used interchangeably, with each performing the other's function. The difference between the two methods is more a matter of custom and tradition as opposed to anything physical. However, it's possible to draw some generalizations. 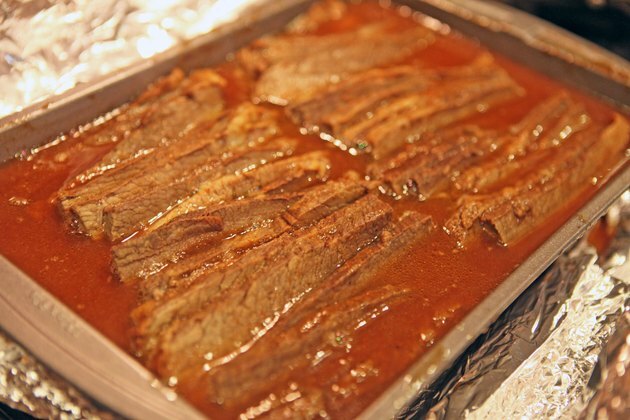 Juices and proteins from your roast meats cook on the pan -- and are difficult to remove -- so roasting pans are made from durable materials that will stand up to scrubbing. They're usually made of aluminum or another metal, though glass and ceramics are also used. They are designed to hold turkeys and other large pieces of roasted meat, so most roasting pans have sides 2 1/2 to 3 inches high to contain the cooking juices. 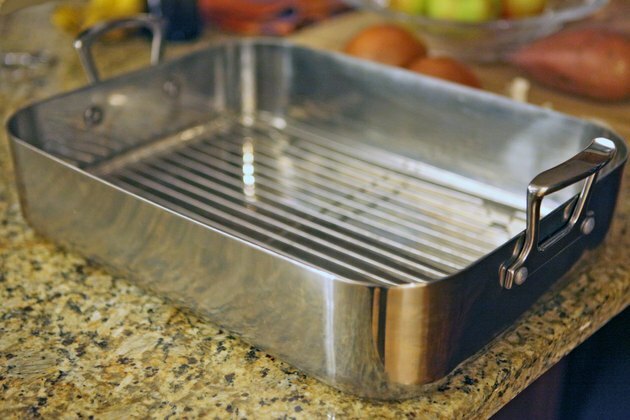 Many roasting pans have an indented bottom, or include a rack, to keep the roast above the cooking juices. Baking dishes are more flexible in size and shape than roasting pans are. They're usually made from glass or ceramic materials, though enameled cast iron and other materials are also used. Baking dishes can be round, square or oblong, shallow or deep, but most have sides only 1 or 2 inches high. 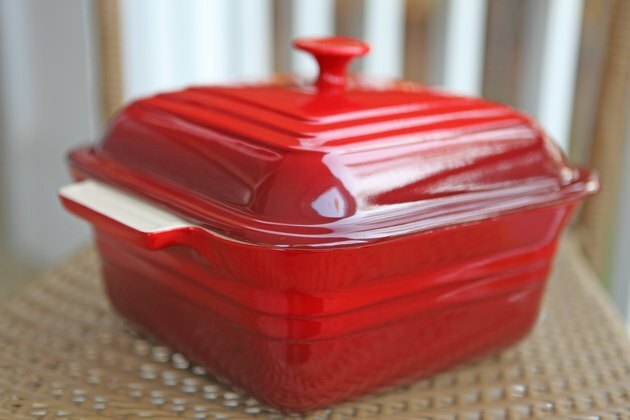 Many come with a matching lid, suitable for use in the oven or the refrigerator. 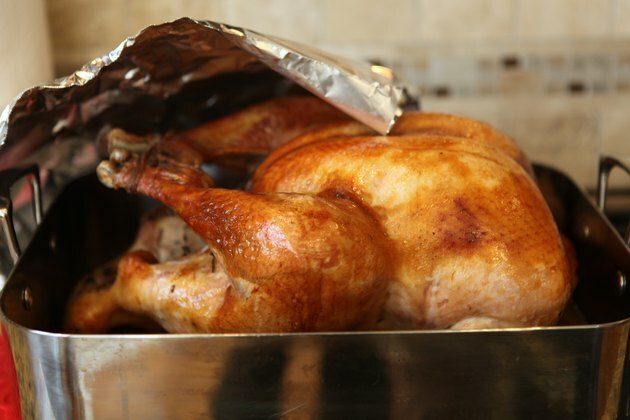 Roasting pans vary widely in size, but even a small one can accommodate a large enough roast to feed a small family, or could hold one or two chickens. Baking dishes tend to be smaller, because even large casseroles are smaller than a full-size turkey. Roasting pans usually include a rack, while baking dishes do not. 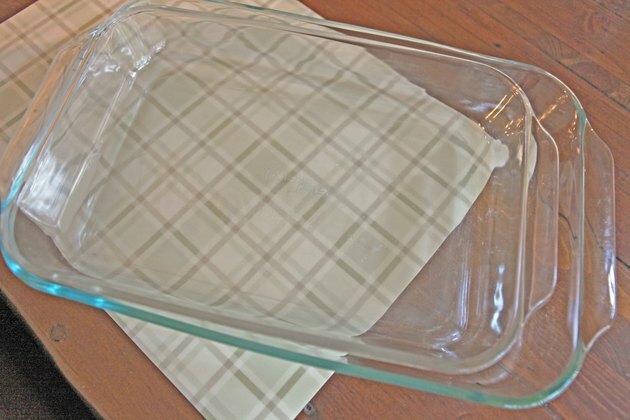 Baking dishes are more likely to come with a lid. Roasting pans are also more likely to have a non-stick coating, whether it is enamel or a modern polymer. The primary use of a roasting pan is to roast foods. However, nothing prevents one from being used as an oversized baking dish to prepare a large cake, casserole or side dish. If your pan did not come with a cover, one can be improvised with aluminum foil. Baking dishes have a wider range of uses; they can serve as tiny single-serving ramekins for crème brulee or containers for the largest of casseroles. They typically heat more quickly than metal pans do, and hold their heat better, so sometimes it's necessary to adjust oven temperatures. A baking dish can also be used for roasting.